Nordhouse Dunes is part of the Ludington Dune Ecosystem, which also includes Lake Michigan Recreation Area, and Ludington State Park. The dunes were formed 3,500 to 4,000 years ago and stand up to 140 feet high. Ludington Dune Ecosystem has the largest area of fresh water interdunal ponds in the world. The interdunal ponds, small water holes and marshes, decorate the area. Dune grass covers many of the dunes and provides habitat for a variety of wildlife species. The Nordhouse Dunes are interspersed with woody vegetation such as juniper, jack pine and hemlock. Plant life is varied and includes the Federally Endangered Pitcher's Thistle. The sand beach along the lake varies from narrow to wide and is home to the Federally Endangered Piping Plover, a shore bird that nests on the ground in small cobbles. 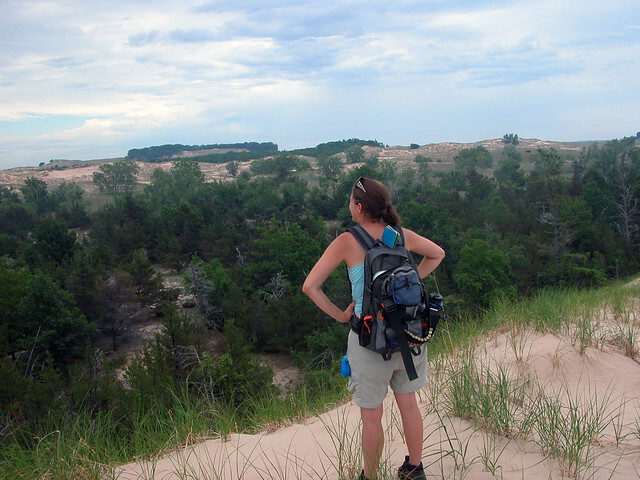 For more information on the Ludington Dune Ecosystem visit the MI-DNRE website. Brochure with Map: This brochure is set to print on 8 1/2 x 14 paper, landscape (wide) orientation. To print on 8 1/2 x 11 paper set the print area to "shrink to printable area", this will make the text on the page smaller. Nurnberg Trailhead: managed Season starts April 1, 2017 and ends Nov. 30, 2017. Day Use Area - Beach Access: managed Season starts April 1, 2017. Day Use Area - Picnic Area: Managed Season starts May 1, 2017 and ends Dec. 1, 2017. This area is gated when closed. No commercial, event or large group (75 people or more) permits are issued in the wilderness area. Parking and/or access road are not plowed. Trails are not groomed in winter. Travel south on US-31 for 7 miles. Turn right and travel west on W. Forest Trail Rd. for 2.5 miles. Turn left and travel south on Quarterline Rd. for 1.5 miles. Turn right and travel west on Nurnberg Rd. for 6.5 miles. Fishing is allowed at Nordhouse Lake. There are no prohibitions against shore fishing on Lake Michigan, however, the shoreline is very shallow and there are few fish. Some of the trails lead to the beach, other sections will lead through the wilderness or to Nordhouse Lake. There are several dispersed campsites along the trail system. The trail system within the dunes is limited and minimally signed. The Lake Michigan Shoreline is the summer habitat for the Piping Plover. The piping plover is a relative of the Killdeer. Piping Plovers are smaller, and lighter colored. Breeding adults have a single black band around the neck, while the Killdeer has two. The Great Lakes population of piping plovers is endangered — they are in danger of extinction. The “piping” part of the name is a description of its call, a sweet, soft whistle. Plovers are a group of shorebirds that feed with run-stop-peck movements, somewhat like the way an American robin feeds. Species For a list of common species found in the Ludington Dune Ecosystem please visit the MI - DNRE website. The shoreline is home to the federally threatened Pitcher's Thistle. The Pitcher’s thistle grows for five to eight years before it flowers. Its non-flowering form is a rosette or cluster of silvery leaves and its flowering form typically has one stem with many branches. The entire flowering plant may grow 3 feet tall. Cream or pink flowers grow at the end of branches and from the leaf axils. For more information on the Pitcher's Thistle visit the Fish and Wildlife Service fact sheet. Species For a list of plants common to the Ludington Dune Ecosystem please visit the MI - DNRE website. There are picnic sites available at Nurnberg Trailhead or visitors can pick a spot anywhere they would like along the trail, dunes or shoreline.